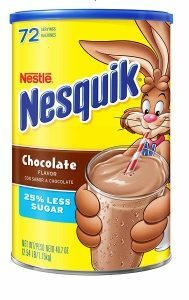 Consumers who may have purchased the affected NESQUIK Chocolate Powder should not consume it, but instead should return it to the place of purchase for a full refund or contact Nestlé Consumer Services at (800) 628-7679. The most common symptoms of Salmonella infection are diarrhea, abdominal cramps and fever, which develop within eight to 72 hours of eating or drinking contaminated food. The illness usually lasts for four to seven days and most people recover without treatment. However, salmonellosis can be severe or even life threatening for infants, older people, pregnant women and those with weakened immune systems. Individuals experiencing these symptoms should seek medical attention. Nestlé is dedicated to the health and safety of its consumers. For these reasons, the company initiated this voluntary recall. We apologize to our consumers and sincerely regret any inconvenience created by this incident.